8 Ways to Improve Your Garden with Shipping Drums! Drum barrels are great for safely shipping all kinds of items because they are airtight, waterproof, buoyant, and durable. However, all those features also make shipping drums good items to recycle into other useful objects to use around your home and garden. Home gardening is exponentially rising in popularity, and for a good reason! Many people are inspired to grow their food because of rising grocery costs and questionable commercial farming practices. Some problems for many hobby gardeners, however, is limited access to available land and freshwater. Recycling drum barrels can help solve both those problems and much more. There are many great ways to recycle shipping drums. Whether you have metal or poly drums, there are fantastic options to upcycle and repurpose them to improve your garden, garage, and patio spaces. First, and probably one of the easiest ways, is to use sections of the barrels for in-ground raised beds. In-ground raised beds are supported areas of fortified soil built directly on top of the existing soil. Normally, their walls are made of wood or concrete, anywhere from 6 inches to 3 feet tall. The extra height and fortified soil give plants the opportunity easily develop roots and properly drain water compared to often densely packed ground soils. Although many raised planters are made from wood or cement block, using cut sections of a poly barrel is a fantastic alternative. Plus, the circular design can support a lot of horizontal soil pressure without the need for extra supports. Poly barrels can also be recycled to make raised table planters, which have many of the same benefits as in-ground raised beds. However, they are nicer for people who have problems bending over to do garden maintenance. Poly barrel table planters often use barrels cut vertically mounted on wooden frame supports. There are many commercially produced vertical garden devices available today but, arguably, the best vertical garden planter you can have are those made from repurposed 55-gallon plastic drums. Not only do drum barrel vertical garden planters save space, but they can also save maintenance and watering time. Because the plants used in vertical barrel gardens are planted in small slits created on the barrel’s exterior, there is little room for weed development. Also, because many of the plants are located on vertical surfaces, the potential destruction from rabbits and rodents is significantly reduced. Poly drum barrels are also great vessels for aquaponic gardening systems. The 55-gallon poly drums can be used upright with little modification as a closed aquaponic system. Also, they can be cut in half vertically to use as individual beds. Then, another whole barrel can be used as the fish reservoir. Creating an aquaponics garden from recycled poly drum barrels is environmentally friendly on several levels. Aquaponics systems can produce up to six times more plants per square foot than conventional soil gardening methods. Furthermore, aquaponic systems require 90% less water use than soil gardens. Finally, plants grow much faster! Meaning, you can produce much more produce in much less time. 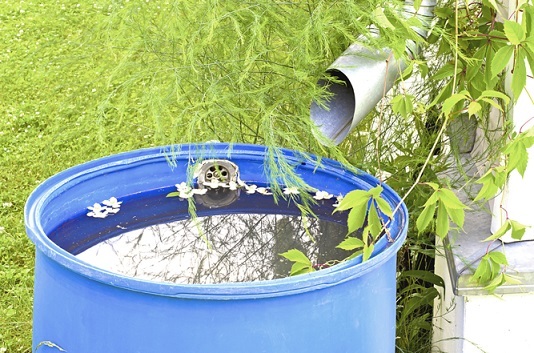 Another wonderful use for 55-gallon poly drums is for rainwater collection. Collecting rainwater in drum barrels assures your garden will receive the best quality water possible. Whether you practice soil or aquaponic gardening at home, it is monumentally beneficial for your plants and fish to have water that is free from chemical treatment like much municipal water. Collecting rainwater in 55-gallon drum barrels is the perfect way to get purified water. Making a drum barrel root cellar is simple, and it can keep your vegetables preserved for many months without costly electric refrigeration. Just make sure to keep dry storage food, such as onions, with other dry storage foods. Do not mix onions and potatoes in the same barrel cellar, for example. To make a drum barrel cellar, just dig a hole about ¾ the depth of the barrel. Drill a drainage hole at the bottom in case humidity condensation pools inside them. Wrap the outside top half of the barrels with foam insulation, then place them into the holes and backfill with dirt. Finally, cover the barrel with a lid or board and secure with rocks or something heavy to prevent critters from invading the cellar. Put straw over the lids for insulation, then cover the straw with a plastic sheet. Why buy a compost tumbler when you can build one yourself using a poly drum barrel? There are many compost tumblers available to purchase in stores, but they often cost hundreds of dollars. The good news is you can build one with an old 55-gallon poly drum barrel, some PVC pipe, and 2×4 construction boards. 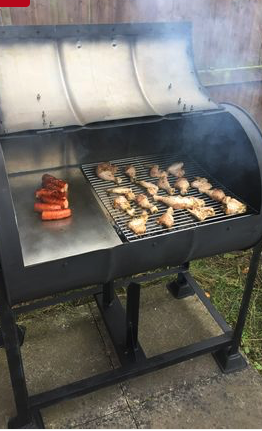 Building a smoker from a metal 55-gallon drum barrel is a fantastic way to easily cook substantial amounts of meat with little effort. Just gather the appropriate parts, and, within a few hours, you can have a nice recycled smoker open and ready for business. Another terrific way to recycle old drum barrels is to make garden tool storage containers out of them. This project is suitable for any used barrel: metal or plastic, food grade or not. Also, it’s a fantastic way to organize your garden shed. To make a garden tool storage unit out of used drum barrels, just find a drum barrel with attached lid. Cut some holes in the cover (make assorted size holes between one and two inches), and fill the bottom couple of inches with sand to stabilize. Secure the lid to the barrel and fill the holes with the handles of shovels, rakes, brooms, or whatever else. When I bought my first house, my grandpa made me one of these, and I’ve been hauling it around ever since. There are many commercial options available for wheelbarrows and lawnmower trailers, but I prefer the homemade ones made from old drum barrels. Not only is it cheaper to repurpose an old drum barrel into a wheelbarrow or trailer, but they are lighter and hold more than most wheelbarrows/mower trailers one can purchase. If you don’t have access to a welder to build a custom barrel frame, you can recycle an old wheelbarrow frame or dolly for the trailer frame. Some people even build seats into the barrels and use them for trolley carts for their kids. It’s like a homesteader’s train attached to the back of a 4-wheeler. No garden is complete without a beehive. 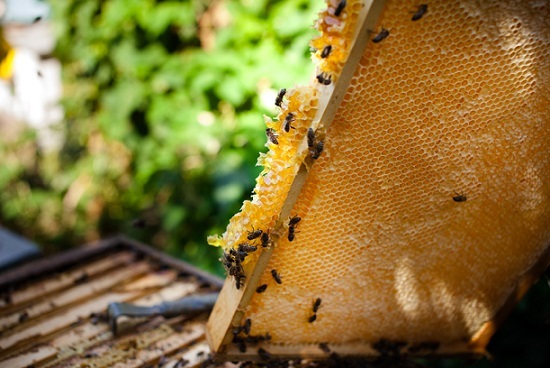 Having a beehive near your garden increases pollination success and helps stabilize a national dwindling honeybee population. Using old 55-gallon drum barrels, you can create raised beehives that are perfect for pollinating small gardens. Plus, the honey that they produce isn’t bad, either. You can also make a honey extractor using drum barrels, and it will likely be much less expensive than buying a premade stainless extractor. there have been tons of smokers and grills make from drums around here where I live. Love that drum table. We use rain barrels at our home. That’s great that you are recycling old drums and we also use have a rail barrel from a recycle drum. Thanks for stopping by and commenting! Thanks! 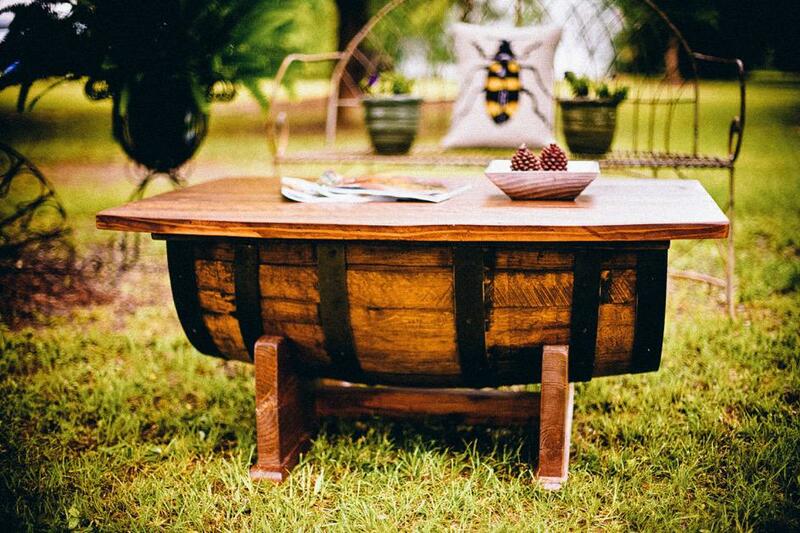 There are so many ways you can reuse any type of barrel if you just use your imagination a little. It can save money and cause so much less waste. Thanks for hosting #GoingGreen every month. Have a great day! It was so delightful to see so many creative ways to recycle shipping drums into other useful objects to use around the home and garden. Thank you for sharing these wonderful ideas with us at the Healthy Happy Green and Natural Party Blog Hop. I’m pinning and sharing. It is amazing how many ways you can use shipping drums in your garden for some many useful ways too. Glad to part of Healthy Happy Green & Natural blog hop. Thanks for stopping by and sharing my article. Wow, this makes me want to run out and get as many barrels as I can find! I want all of those things. 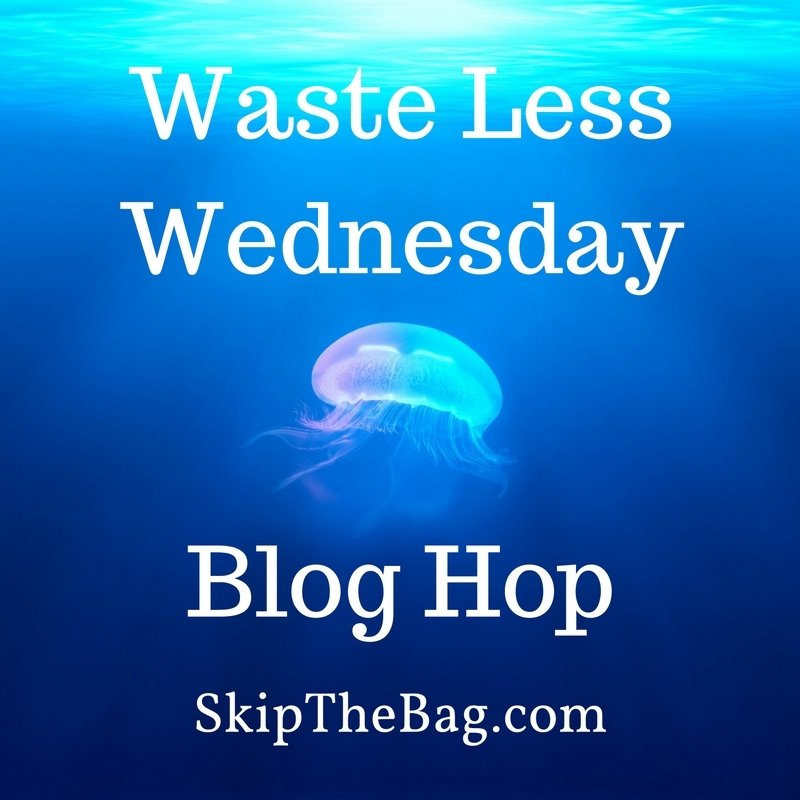 Thanks for sharing on the #WasteLessWednesday. blog hop!. Glad you liked the article. Thanks for stopping by and commenting. Go get some shipping barrels and have fun using them. Have a healthy, happy & blessed day!